Looking for Land? Land for sale on the Central Coast, Lake Macquarie and Hunter Valley Regions! Yeramba Estates’ passion is to design the perfect blocks of Land for people to build their dream home. Like minded people invest in Yeramba’s Land knowing their lifestyle will be built on a solid foundation. We have chosen Central Coast, Lake Macquarie and Hunter Valley regions as they offer great returns on investment and host an abundance of activities to improve your quality of life. Yeramba has helped people for over 50 years to find that ideal property to suit their needs while offering the very best in estate planning. With nearly 130 subdivisions under its belt, you can be assured your new lifestyle or investment decision will be rock solid. 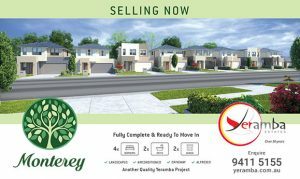 Hamlyn Grove Stage 3 is now available with 17 of the 27 level lots already sold. These lots are 462sqm awaiting your perfect home. These lots are registered and ready to build on. Close to schools, shopping, centres, beaches and sporting facilities with further stages being planned, Hamlyn Grove at Hamlyn Terrace is Yeramba’s best estate yet. All remaining lots are priced at $337,000. Vacant site at 36 Grasstree Avenue Woongarrah. ONE SPECIAL LOT! Set amongst established quality homes, this lot is already fenced on two sides. Registered and ready for your building plans, it is 452sqm – an opportunity too good to miss. Vacant Lot 114 in Hamlyn Grove now available, ready to build on. 486sqm, $345,000.